The learning event has ended; the learning process continues. And, when all is said and done, one of the many important ways by which any of us can and will measure the success or failure emanating from Mount Prospect Public Library’s 2016 Staff Inservice Day “From eLearning to Learning” (the day-long exploration of how staff at the Library can better define and incorporate e-learning into its work) will be through the transformations it actually does or does not manage to produce for those involved and for those they/we serve. As mentioned in earlier sections of this case study of how a day-long exploration of e-learning can lead to more productive, effective, and creative use of e-learning within an overall learning landscape, we already know positive, potentially far-reaching transformations were occurring. Co-conspirators (the onsite participants in this training-teaching-learning-doing opportunity) clearly expanded their definitions and understanding of the state of contemporary e-learning and the possibilities it provides in workplace settings. Some of them posted their first tweets as part of the process of gaining a richer, more nuanced vision of how Twitter and other social media tools can be engagingly integrated into onsite as well as online learning opportunities to the benefit of everyone involved. Many of them contributed ideas face-to-face and online to expand the use of e-learning among staff members and among library users near and far. And some of them used Twitter to talk about what they hope and intend to do as a result of what they experienced. As a co-learner as well as planning team member and presenter/facilitator in “From eLearning to Learning,” I know even I left feeling unexpectedly and significantly transformed by my involvement. I’m sure there is a wonderfully academic term to describe what I felt as the day came to an end and during the hours of reflection and conversation I’ve had with colleagues since leaving Mount Prospect, but I keep coming back to something far more basic and visceral: it blew my emotional pipes out! I was stunned. Elated. Inspired. And, at times, close to tears. Because everything was so…much…more…wonderfully and overwhelming intense and inspiring than even I expected it to be; I already carry a deep sense of gratitude to the staff members who invited me into the process and to those magnificent staff members who pushed the learning envelope so far during our onsite and online time together that day. Among the continued-learning opportunities I already have pursued is the opportunity to expand upon and adapt in my own way a learning approach I saw Tom Haymes, a fabulous New Media Consortium (NMC) colleague, use during his own “Idea Spaces” presentation at an NMC conference a couple of years ago. His onsite Idea Spaces presentation and discussion gave all of us plenty of room to learn from him in the moment, to learn from each other in the same moment, to reflect upon what we were hearing and learning, and to see the “event” as part of a process. More significantly, Tom created a beautifully expansive learning opportunity that helped me see how onsite and online learning could seamlessly be interwoven. His slide deck was posted and available on an Idea Spaces website (which, as I glance back at it in writing this part of the “From eLearning to Learning” case study, has expanded tremendously and magnificently since I last visited it.) The site itself was and remains a stand-alone expansion of what he was sharing with us; it was and is, at the same time, an integral part of the onsite experience. It includes a variety of resources for those of us interested in pursuing the topic in our own way. On our own time. Whenever we want to continue the training-teaching-learning-doing process. And, with that in mind, it occurred to me that what all of us designed for the onsite “From eLearning to Learning” experience easily translates into a modified version of what Tom modeled through his use of WordPress as a platform for the onsite version. Tom (and many others) have used WordPress as a virtual course meeting place. I’ve used my own website “Previous Presentations” page as a central virtual meeting place for ongoing use and exploration of the material we all developed through the planning process and our onsite participation, and have added links to the content to the “Presentations/Courses” page of this WordPress Building Creative Bridges blog, which serves as a secondary website/learning resource to expand the reach of what I do and document. I’ve also made minor modification to the slide deck I posted so there are references to the other current components of the suite (including the Storify document). The Storify document ends with a note providing a link to the PowerPoint deck with extensive speaker notes. This five-part case study on my blog is becoming an integral part of the suite by including links to other components at the bottom of each of these articles, and there are references to it sprinkled among the other resources and promoted via my LinkedIn, Twitter, and Facebook accounts. And I’m looking at fine-tuning and providing access to additional resources that came out of the planning and day-of-the-event interactions so anyone interested will have a road map they can follow in the same way that Tom’s Idea Spaces continues to serve as a virtual road map and very real, tremendous source of inspiration nearly two years after I participated in the onsite version. So, there we have it: the current state of e-learning and a view toward pulling it into the overall world of learning rather than being something all-too-often mistakenly seen as inferior to other types of learning. We learn onsite while incorporating online learning opportunities that produce potentially long-lasting, useful resources openly shared with anyone who might benefit from them. We learn online synchronously and/or asynchronously so that learning occurs at our moment of need, when we are ready and primed for it, rather than being where we were a decade or two ago—largely dependent on the availability of teachers and trainers who stood in the front of a room and lectured at us. In the contemporary learning environment onsite and online, there often is no front of the room. The room is the entire world, the learners are fabulous, often self-motivated, inquisitive and collaborative co-conspirators in the learning process, and in the best of situations we are able synchronously or asynchronously to enter the room and work with our co-conspirators to produce positive effects that ripple out into our extended community of work, service, and play. NB: This is the fifth of five articles documenting the process of helping to plan and facilitate a day-long exploration of how to effectively incorporate e-learning into our learning process. Companion components to “From eLearning to Learning” currently include a PowerPoint slide deck with extensive speaker notes, a facilitator’s guide, a lightly edited and annotated Storify document capturing that part of the conversation that occurred via Twitter, and online shared documents that contain content added by the learners during throughout the day of the main event. Some are shared here through those live links with the express approval of Mount Prospect Public Library training staff. For help in developing and facilitating a similar event tailored to your organization, please contact Paul at paul@paulsignorelli.com. The unexpectedly explosive and transformational decision to try using Twitter to incorporate positive onsite-online e-learning experiences into Mount Prospect Public Library’s 2016 Staff Inservice Day “From eLearning to Learning” (the day-long exploration of how staff at the Library can better define and incorporate e-learning into its work) was almost an afterthought. It came up and was quickly adopted during a final planning meeting the day before the event, as I mentioned in the third of these five “case study” postings. It’s not as if Twitter as part of our e-learning landscape is unfamiliar to trainer-teacher-learner-doers; we use it extensively in learning opportunities ranging from conference backchannel discussions to tweet chats along the lines of what #lrtnchat, #etmooc, and many others do. I often, through the “Rethinking Social Media” course I designed and facilitate for ALA Editions, call attention to the intriguing, cutting-edge work Rey Junco has done with Twitter and other social media tools in academic settings. And I’ve been lucky enough to experience high-end, dynamically-facilitated blended environments through participation in events creatively crafted by the New Media Consortium and other organizations. But using it as a way of helping our “From eLearning to Learning” co-conspirators (the learners shaping and participating in the day-long event at the Library) opened doors none of us even began to imagine at the moment during which we initially discussed creating and using #mpplsid16 as a way of showing how social media tools can creatively, effectively, and easily help us redefine our learning spaces. More importantly, that rapid expansion of everyone’s vision of what the e-learning landscape currently encompasses provided an amazing demonstration of the way a well-designed learning opportunity, developed collaboratively with learners and their representatives, can transform learners (and learning facilitators) within a very short period of time. Having suggested to our co-conspirators that they could use Twitter as a way to take notes to which they could later return, and as a way to extend the reach of our gathering far beyond the physical walls of the various rooms in which we were meeting, I turned my full attention to the onsite setting during my keynote presentation. I didn’t return to Twitter until we had our first break—the one between the keynote and the first of three periods set aside for breakout discussions. I was absolutely floored by the level of tweeting that was already occurring. Some people were responding (very positively) to what was taking place; others were observing what was happening around them. And a few were sharing content in those Twitteresque 140-character bursts that shot around the world. The result was that we were beginning to work onsite and online simultaneously, and a few of the tweets were being retweeted by others across the United States and in Europe (apparently attracted by my occasional use of the combined hashtags #learning and #innovation). Seizing the opportunity during the break, I retweeted a few of the more thoughtful tweets and responded to a few of the tweeters—which, of course, set the tone for an extended onsite-online expaned-e-learning-environment conversation that was still continuing as I rode a commuter train from Mount Prospect into Chicago early that evening. Recognizing the potential there for a stand-alone learning object that anyone could continue to draw upon as long as it remains available, I remained in my hotel room an hour longer than anticipated before heading out for dinner; I knew that if I didn’t collect and transfer those tweets into a Storify document that included light annotations to set the context for what had just occurred, I would lose the in-the-moment excitement the entire experience had generated. It was available to anyone that wanted to seek it out less than four hours after “From eLearning to Learning” had adjourned. It also has become part of an overall “From eLearning to Learning” suite of freely accessible resources for anyone interested in trying a similar experiment within their own learning environment; links are included at the bottom of this post. I was part of the first-rate Mount Prospect Public Library Staff Inservice Day planning team that designed and facilitated the process. I was the keynote presenter-facilitator, and trained the staff facilitators who led the breakout sessions. I know Twitter, I use Twitter, and I adore what is good about Twitter. But even I remain stunned by the depth of learning and the nuances contained within that particular Storify item. It has plenty of playful exchanges. It has tweets acknowledging the conversational nature of the “From eLearning to Learning” Twitter feed. It has lovely, poignant tweets about personal learning experiences—including one about how the Library director posted her first tweet as a result of what she was experiencing that day. It had some wonderful comments about how much staff enjoyed and learned from the event, and how enthusiastically they are looking forward to building upon what we built together in the best of all possible experiential-learning (hands-on) approaches—something fun, engaging, meaningful, replicable, and actionable. But what stands out to me most as I continue rereading it, skimming it for previously-missed gems, discussing it with friends and colleagues, and learning from what all of us at Mount Prospect Public Library created out of our individual and communal learning experiences within that very attractive and dynamic community of learning, is how much it captures the wonderful results flowing from onsite-online (blended) learning opportunities that are learner-centric, goal-driven, and designed to produce results. NB: This is the fourth of five articles documenting the process of helping to plan and facilitate a day-long exploration of how to effectively incorporate e-learning into our learning process. Companion components to “From eLearning to Learning” currently include a PowerPoint slide deck with extensive speaker notes, a facilitator’s guide, a lightly edited and annotated Storify document capturing that part of the conversation that occurred via Twitter, and online shared documents that contain content added by the learners during throughout the day of the main event. Some are shared here through those live links with the express approval of Mount Prospect Public Library training staff. For help in developing and facilitating a similar event tailored to your organization, please contact Paul at paul@paulsignorelli.com. There is always a moment of stunned silence when I initially tell new “co-conspirators” (i.e., prospective clients) that I want to be onsite in their city a full day before the day of an event/presentation (e.g., arriving Wednesday evening for a presentation to be held on Friday). And the silence deepens when I explain that I would prefer to fly out the morning after a day-long event rather than rushing off to an airport as soon as the final words I’m going to say have passed my lips. Parachuting in and then being quickly airlifted out, I explain, is not a great way for us to work together to produce the concrete training-teaching-learning-doing results we all hope to produce. “We don’t have it in our budget to pay for three nights of a hotel,” they usually admit. And that’s when the “co-conspiratating” process begins. I explain that arriving so early guarantees that they’re going to receive the best I can deliver since they won’t be facing a bleary-eyed, half-coherent presenter-facilitator exhausted from spending the night in an airport because of a delayed flight. I tell them that I want to have a leisurely tech check of the onsite facilities so we can anticipate and trouble-shoot any unexpected problems we identify during that day-before-the-event meeting. I also want to have a final face-to-face fine-tuning session with them so I can personalize the slide deck and speaker notes I’ll be using with them and the co-conspirators who are the learners. I tell them, furthermore, that I want at least a few hours on my own to explore their community, overhear conversations about what is important and happening in that particular moment in that particular community so I can more effectively work with them to deliver what they have asked me to deliver during our formal time together. And, most importantly, I tell them that I don’t want to have to rush back to an airport and, by engaging in that anxiety-producing beat-the-clock exercise which currently is even worse because of extended lines to pass through airport TSA Security checkpoints, miss the opportunity for the level of post-event discussions onsite and online that produce some of the loveliest learning moments for all of us. We always find a way to overcome budget constraints. After all, we’re trainer-teacher-learner-doers: we know how to seek and implement solutions in the moment. And once we have passed that hurdle, magic happens—as was the case recently during Mount Prospect Public Library’s 2016 Staff Inservice Day “From eLearning to Learning,” the day-long onsite and online exploration of how staff at the Library can better define and incorporate e-learning into its work (which is at the heart of this case study). The magic I have come to expect from this level of pre-session conversation and tour of the area where I will be working began almost immediately. As we returned to a theme we had been discussing from January to early May of this year, we once again talked about ways to easily take the onsite learners into online environments so they would viscerally understand the nature of our dynamic onsite-online e-learning/blended learning landscape. “Does your staff use Twitter much?” I asked at one point, and that became a transformative moment for all of us (learners included) less than 24 hours before the highly interactive keynote address began. NB: This is the third of five articles documenting the process of helping to plan and facilitate a day-long exploration of how to effectively incorporate e-learning into our learning process. Companion components to “From eLearning to Learning” currently include a PowerPoint slide deck with extensive speaker notes, a facilitator’s guide, a lightly edited and annotated Storify document capturing that part of the conversation that occurred via Twitter, and online shared documents that contain content added by the learners during throughout the day of the main event. Some are shared here through those live links with the express approval of Mount Prospect Public Library training staff. For help in developing and facilitating a similar event tailored to your organization, please contact Paul at paul@paulsignorelli.com. Setting the agenda (at multiple levels) is always part of a successful learning event/presentation. It’s no surprise, therefore, that my “co-conspirators” on the Mount Prospect Public Library 2016 Staff Inservice Day planning committee and I focused on this for “From eLearning to Learning,” a day-long onsite and online exploration of how staff at the Library can better define and incorporate e-learning into its work, throughout the planning phase (from January through early May 2015). A more subtle, nuanced approach to setting the agenda was at the level of deciding how we, as co-conspirators in the planning and facilitation process, would work together; that’s how we settled on the approach briefly described in the first of these five “case study” postings. We followed an informal “how to run a meeting” process I’ve been successfully using for years: I very much see meetings as theater, with strong elements of improvisation thrown in for good measure. Each item on a meeting agenda is meant to be part of a carefully-crafted script from which we can deviate as needed (hence, the improvisational element), and each item should produce something concrete that leads to the next item on the agenda. When this approach to setting agendas and facilitating meetings works well, it produces results that are as engaging, entertaining, and transformational as a great piece of theater is. We walk away knowing we have been involved in something significant. Something that makes us see our world at least a bit differently than we saw it before we were together. And something that makes us want to transform a potentially ephemeral moment into a very long, extended moment of process that continues to grow as long as we take the time necessary to nurture it. What could we do to be sure that everything we offered created a visceral sense of understanding the power of eLearning as a component of our overall approach to learning? What could we do to assure that everything that happened during “From eLearning to Learning” connected back to the Library’s strategic plan in terms of incorporating eLearning into its learning offerings? Keeping our focus on the learning experience, we also built plenty of reflection time and shared debriefing time so the learners would be able to absorb what they would be experiencing. We scheduled 15-minute breaks between each of our proposed chunks of learning (keynote, the three break-out sessions, lunch, and the final “bringing it all back together/next steps” session). Subsequent meetings focused on content for the break-out sessions; discussion about developing a facilitator’s guide—the bones of that simple two-page guide came out of a 15-minute discussion during one of our telephone conference calls; a series of questions the facilitators would ask to foster lively and productive discussions during the break-out sessions; and a final structure that brought everyone back together briefly at the end of each break-out session for additional brief wisdom of the crowd moments. In this way, we made sure there were the small, very fruitful opportunities for each voice to be heard, and the larger opportunities for everyone to stay on track in terms of understanding how these small-picture sessions would contribute to a large-scale transformation of the entire staff’s approach to e-learning as part of the overall learning landscape in which we operate. A critically-important moment occurred late in the planning process, when we decided that those who wanted to be able to step back a bit over lunch could do so, and those who wanted to engage in a mini unconference to more deeply explore topics that had come out of the morning sessions would have that opportunity in a way that put them at the center of the learning process. We’ll look more at what came out of the unconference in Part 4 of this case study; Part 3 will focus on how and why we had a pre-event onsite meeting the day before “From eLearning to Learning” was held—and the important modifications that came out of that final, lively discussion. NB: This is the second of five articles documenting the process of helping to plan and facilitate a day-long exploration of how to effectively incorporate e-learning into our learning process. Companion components to “From eLearning to Learning” currently include a PowerPoint slide deck with extensive speaker notes, a facilitator’s guide, a lightly edited and annotated Storify document capturing that part of the conversation that occurred via Twitter, and online shared documents that contain content added by the learners during throughout the day of the main event. Some are shared here through those live links with the express approval of Mount Prospect Public Library training staff. For help in developing and facilitating a similar event tailored to your organization, please contact Paul at paul@paulsignorelli.com. “Co-conspirators” is a term I’ve loved ever since I first heard it used by colleagues in the Educational Technology & Media massive open online course (#etmooc) in 2013. Within its training-teaching-learning-doing context, it implies a sense of richly nuanced and deeply rewarding collaboration between learning facilitators and learners unlike any other I’ve experienced in our onsite and online (blended) learning environments. So, when I was invited in essence to become a co-conspirator (we, as a group, weren’t yet using that term) with Staff Inservice Day committee members at Mount Prospect Public Library eight months ago, I eagerly jumped at the opportunity. The result was that I became part of another magnificent community of learning that has just produced a stunningly beautiful and tremendously inspiring example of all that can go right in planning and facilitating an e-learning experience—even one very-much grounded within an onsite setting. What all of us (Library Staff Inservice Day planning committee members, as planners-learners-participants; I, as the consultant-presenter helping them shape an event that supported learning goals contained in the Library strategic plan; the learners themselves; and a few people offsite who occasionally joined us on the day of the event through a very active Twitter feed) produced looks as if it will have exactly the long-term positive impact all of us were hoping to produce for and with the library, its staff, and the members of the community it serves. Everything about “From eLearning to Learning,” a day-long onsite and online exploration of how staff at the Library can better define and incorporate e-learning into its work, ultimately was drawn from and became an example of the extensive e-learning environment we currently inhabit—far more, as I reminded them, than the usual module-out-of-a-box and final multiple-choice exam to mark the conclusion of a learning experience. In our setting, there is no beginning and there is no discernible end. “From eLearning to Learning” continues a process begun long before I became involved, and the day-long “event” simply prepares them to continue their learning/e-learning process well into the foreseeable future. Even the initial steps for this onsite-online exploration were grounded in e-learning. I was, for example, initially contacted by a member of the Staff Inservice Day committee who had initially met me through her participation as a learner in a four-week online “Rethinking Social Media” course I have designed and that I continue to facilitate for the American Library Association. Without that shared experience in an innovative online learning environment, my Mount Prospect colleague and I might not have made this particular connection and I wouldn’t have had the opportunity to be part of one of the most innovative and rewarding learning experiences I have ever helped design and facilitate. Because the obvious distance between San Francisco and Mount Prospect (which is approximately 20 miles northwest of Chicago) is so great, all of us quickly agreed that the planning process itself would take place within a blended environment comprised of conference calls by phone and asynchronous interactions that ultimately produced our planning document and a facilitator’s guide to be used by the staff members who would foster discussion during break-out sessions we arranged throughout the day. In a significant way, we were, as trainer-teacher-learner-doers, adapting a Flipped Classroom model approach to our meetings: at almost every stage of the process, we completed initial work on our own, had information to review before meeting by phone, and productively used our “classroom” time (the conference calls) to produce something concrete, and then repeated the process up to the day of the actual event. What was clear from the beginning of our “conspiratating” was that we were committed to producing something that was far more than a one-day diversion that would soon be forgotten. Drawing upon the principles from the book The Six Disciplines of Breakthrough Learning: How to Turn Training and Development into Business Results and remaining committed to producing something that was in alignment with the Library’s current strategic plan, we worked together to shape something that would be as much a process as an event. The learners/co-conspirators within the library knew well in advance what we were planning; they even provided tremendously useful information via a SurveyMonkey survey to be sure that we would be providing them what they needed (and, in that part of the process, probably became aware of how SurveyMonkey itself could be part of their efforts to effectively shape their overall e-learning landscape). Those of us on the planning committee initially created a broad subject-specific agenda. We fine-tuned it over the course of several months to be sure it would lead to fruitful discussions and positive transformation for everyone involved. We continually looked for ways to innovatively provide experiential learning opportunities the learners could immediately adapt and apply within their own workspaces. One idea, for example (a mini unconference during the lunch hour) came relatively late within the planning process; it ultimately produced ideas (including a proposal for a library-wide e-learning think tank) that participants seem eager to explore and create. And a final, unexpectedly rewarding idea—to incorporate Twitter into the event so our co-conspirators in the learning process would viscerally understand how Twitter has become an effective and dynamic part of our learning landscape—was added to the picture during the onsite meeting less than a day before “From eLearning to Learning” took place. NB: This is the first of five articles documenting the process of helping to plan and facilitate a day-long exploration of how to effectively incorporate e-learning into our learning process. Companion components to “From eLearning to Learning” currently include a PowerPoint slide deck with extensive speaker notes, a facilitator’s guide, a lightly edited and annotated Storify document capturing that part of the conversation that occurred via Twitter, and online shared documents that contain content added by the learners during throughout the day of the main event. Some are shared here through those live links with the express approval of Mount Prospect Public Library training staff. For help in developing and facilitating a similar event tailored to your organization, please contact Paul at paul@paulsignorelli.com. With my ALA Editions “Rethinking Digital Literacy” co-conspirators (AKA learners) currently exploring the broad question of “who owns the learning” in digital environments, I saw at least one obvious answer while co-hosting and participating in a tweet chat about hyperlinked learning last night: anyone willing to be a collaborator/co-conspirator in the learning process owns the learning. The question about ownership of learning—engagingly examined by Alan November in a book and a TEDx talk we’re exploring in Rethinking —is important and double-edged for any trainer-teacher-learner working within a digital environment. It makes us think about who retains (or should retain) access to all our discussions, learning objects, and other tangible aspects of the online-learning process that are usually lost to us once a course formally concludes and the course learning management system is closed to learners. The question also makes us think about who has responsibility for nurturing and sustaining the (lifelong) learning process that is an essential component to fostering digital literacy. 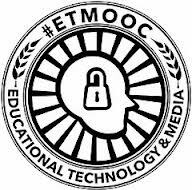 With my tweet-chat colleagues in the Educational Technology & Media massive open online course (#etmooc) community, the answer to both facets of the question is obvious and openly accessible. All of us involved in that particular community of learning retain (and openly share) access to the artifacts produced through our learning—e.g., through blog postings that occasionally connect to and interact with blog posts from other members of the community; through archived recordings of our interactions during the course and those that continue to take place in Google Hangouts and any other accessible online tool we can find and explore as part of our continuing learning efforts on the topic of educational technology and media; and through tweets and the Storify learning objects we produce. More importantly, we shape those discussions and artifacts collaboratively and through our own initiative—this is learner-centric, learner-driven learning at a very high and productive level. We have learned to take the responsibility for asking what we can do rather than relying solely on others to facilitate our learning process. For the tweet chat last night, a couple of us prepared the script with questions to be used during the tweet chat. We facilitated the session. I then edited and posted the Storify transcript of the event so other members of the community could be part of the effort to use and disseminate that resource. The result is that while learning, we also made—and are continuing to make—it possible for others who want to learn more about hyperlinked learning to do so while also seeing how a self-directed community of learning operates. Owning the learning at this level always seems to produce results far beyond anything we anticipate. The hyperlinked-learning tweet chat, for example, produced numerous examples of hyperlinked learning in action. There was the magnificent “Tutor/Mentor Learning Map,” with more than 2,000 hyperlinks to other resources, prepared and shared by #etmooc community member Daniel Bassill. There were exchanges about tech tools some community members had not yet tried. There were informal attempts to define hyperlinked learning, including Daniel’s suggestion that it “is like island-hopping in a huge ocean of knowledge. You can go from place to place in any direction”; Shuana Niessen’s suggestion that it’s “non linear responsive learning”; and my own observation (based on our source material from Michael Stephens) that it’s “what we did/do in #etmooc: connecting, exploring, playing, collaborating, learning experientially” and what I’m fostering among my Rethinking Digital Literacy co-conspirators. What made the session particularly interesting was how often the discussion about hyperlinked learning actually became an example of hyperlinked learning. There was the moment, for example, when we had a unexpected appearance from Alec Couros, who with his own original group of co-conspirators designed and facilitated that MOOC that inspired us to assume shared ownership (without in any way excluding Alec) of the #etmooc learning community. And there were plenty of other moments when learning by hyperlink drew in new colleagues as well as a few we hadn’t seen in quite a while. Nothing could speak more viscerally and meaningfully to the topic of hyperlinked learning than a community so completely hyperlinked that interactions continue to grow rhizomatically—a theme we explored during the formal course and continue to explore and nurture with every new action we take. Rereading the Storify transcript a few times led to additional reflection—and learning—for me throughout the day today as I continued to produce this article. I repeatedly was struck by how the act of collaboratively shaping our learning experiences means that we hone other digital-literacy skills at the same time: being able to work within ever-changing online environments; being willing to contribute to our own learning and to the growth of our learning communities; and being able to capture discussions, learning objects, and other aspects of the learning process so they remain accessible rather than locked away in something akin to the storage crate housing the Lost Ark of the Covenant at the end of Raiders of the Lost Ark. As I return to my Rethinking Digital Literacy co-conspirators—those learners who are so creatively and effectively crafting their own learning experiences—I look with admiration at the ways they are, in Week 3 of our four-week course, continuing to expand the ways they interact across as many digital platforms as possible. They—we—will leave distinct traces, if not much larger artifacts, of our time and collaborative learning efforts. It’s what was done in #etmooc; it’s what some of us have done in the Open and Connected Learning MOOC (#oclmooc) and the Connected Courses MOOC (#ccourses); and it’s what is creating the possibility that what we create during our four formal weeks of shared learning will remain accessible to current learning community members as well as to others who might want to learn from what we are accomplishing together. In these dynamic, digitally-literate learning communities driven by hyperlinked learning, connected learning, connectivist-learning precepts, we are all co-conspirators. And we all own the learning, in every possible sense. N.B. : This is the fourth in a series of reflections inspired by our ALA Editions “Rethinking Digital Literacy” course. There is no denying that playing and working in a variety of digital environments can sometimes feel akin to trying to drink out of a fire hose. There is also no denying that there’s another way to approach digital/online interactions: as if they produce magnificent waves well worth riding to a warm and welcoming shore—which pretty much describes the experiences I had riding rather than drowning in digital interactions last week as our ALA Editions four-week online course “Rethinking Digital Literacy” continued. While the learners I am supporting—and have, as an extension of what I have learned elsewhere, begun referring to as my “co-conspirators” —spent the second of four weeks trying to define and determine ways to foster digital literacy among those we serve, I continued engaging in my own efforts to see where a blend of onsite and online interactions involving a wide range of friends and colleagues might take me—a tremendously satisfying exercise that culminated in a richly rewarding conversation with T is for Training colleagues at the end of the week. Plenty of disparate elements had to come together for that particular wave to carry us all to shore, and they seemed to coalesce around a very specific digital-literacy skill: an ability to collaborate across numerous platforms and environments. The experience began early in the week as a local (San Francisco Bay Area) colleague (Clark Quinn), with whom I tend to interact more frequently online than face to face, was confirming lunch plans with me. Taking advantage of an hour-long trip via public transportation to reach Clark, I read several recent posts on his blog, where he consistently and engagingly addresses training-teaching-learning issues of interest to those of us working with adult learners in workplace learning and performance (staff training) settings. The punch line to one of his most recent posts—“…it’s not about content [in learning]. It’s about experience [in learning]. Are you designing experience?”—led to an intriguing conversation over lunch as I carried that online resource and inspiration into our face-to-face environment. But it didn’t stop there: I sensed there was plenty more to explore, and suspected a perfect venue drawing upon our digital literacy skill of collaborating within digital environments was back in the online sandbox I share with colleagues through Maurice Coleman’s biweekly T is for Training conversation/podcast—a program designed for those of us involved in library training-teaching-learning efforts. When Maurice and our T colleague Jill Hurst-Wahl agreed that Clark’s post and the question regarding content vs. experience would be a great topic for discussion, I notified Clark to see if he wanted to join us; he and I also continued the conversation briefly via exchanges in the weekly #lrnchat tweet chat (with an entirely different set of colleagues discussing tech trends) the night before the T is for Training was scheduled to take place. Initially indicating he wouldn’t be available, Clark ultimately was able to join the conversation a few minutes after that episode of T began, and the results were every bit as stimulating as any of us might have hoped. A core group of the T “usual suspects” quickly welcomed Clark and interacted in ways that brought his non-library learning and development expertise to the forefront of the conversation; Clark, in turn, dove into the conversation in ways that helped him better understand how designing experiences in library training-teaching-learning efforts paralleled as well as differed from what he has seen elsewhere. By the end of the hour-long exchange, many things were obvious. The cross-pollination that occurs through interactions among members of various online communities—particularly the kind of online connected-learning communities with which I’m familiar—can bring benefits to everyone involved. This variation on hyperlinked learning—comprised of playing, learning, telling stories, transparency, participation, harnessing user-generated content (in this case, Clark’s blog post), and making connections, as Michael Stephens has suggested—benefits tremendously from our willingness to carry a variety of approaches into our continually evolving and ever-increasing tech tools. This combination of cross-pollination and hyperlinked learning produces notable results, small and large: T, for example, may have picked up a new usual suspect (if Clark is able to join us for additional conversations); Clark may be continuing the conversation in an upcoming Learnlet post to carry it to a larger audience; I’m certainly continuing this set of explorations further via my own blog and a tweet chat I’ll join later this week with #etmooc (Educational Technology & Media massive open online course) colleagues; and I will carry it back to the learners/co-conspirators in Rethinking Digital Literacy in the hope they can use it with their own colleagues in a number of different countries. Ultimately, this level of collaboration, designing learning experiences, and riding rather than drowning under waves of digital interactions and resources creates exactly the sort of learning experience I pictured when I read Clark’s blog post. More importantly, it supports our efforts to hone that very important digital-literacy skill of collaboration that, at its essence, supports the way we live, play, and work positively, creatively, and enthusiastically in a hyperlinked world. N.B. 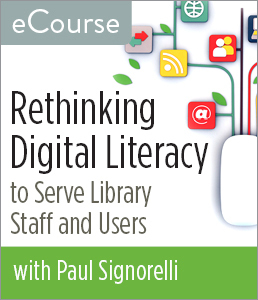 : This is the third in a series of reflections inspired by our ALA Editions “Rethinking Digital Literacy” course. Building Creative Bridges by Paul Signorelli is licensed under a Creative Commons Attribution-NonCommercial-NoDerivs 3.0 Unported License. Based on a work at https://buildingcreativebridges.wordpress.com.